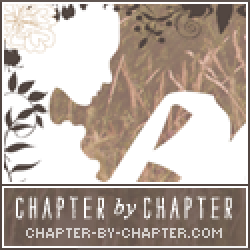 I had no clue what to expect from author M. Beth Bloom’s Don’t Ever Change. I’ve read her novelDrain You a few years ago and I recall having enjoyed the experience very much. 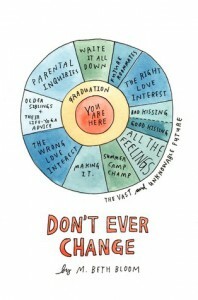 The premise for Don’t Ever Change had my attention—a protagonist who is an aspiring author? Sounds about as relatable as it gets—and with that alone to comfort me, I jumped right in to Don’t Ever Change. In Don’t Ever Change, Eva has just graduated high school. She should be elated. After all, the dreadful experience that is high school is finally over and done with! She can finally embark on the next chapter of her life—that is, if she can get her English teacher’s parting words out of her mind. Eva is an aspiring author who has been told to write about what she knows. But the only issue with that piece of advice is that Eva doesn’t know what she knows. Meeting new faces and forming new relationships, Eva decides to spend her final summer before University to figure out who she is. And, hopefully as a result, find out just what it is she knows. I seldom ever get irritated with a novel’s protagonist and often, found myself rolling my eyes at Eva. I know that that sounds very negative but it really isn’t. Eva’s a very unique character. She comes off as over-confident and full of herself, even though we know that she is the total opposite internally (sometimes). As a reader, we get to experience Eva’s internal turmoil while also watching her external actions say the opposite. So many times, listening to Eva and watching Eva interact with other characters had me ripping my hair out because of the way she would almost talk down to them. She’s such a flawed character and I really enjoyed that about her. As Eva tries to discover herself, there is a bit of a side-plot romance that takes place in the story. First with a total wannabe rockstar in the form of Elliot, and a will-they-won’t-they thing going on with Zack. I’m a sucker for romance and actually really liked the way it was portrayed in Don’t Ever Change. It wasn’t overdone in a way that took over the plot or made it central to Eva’s character, but the additional romance definitely leaves readers interested and hooked. You want to know if Eva will fall in love. You want to know what this will do to her ‘mission’. You just want to know. The only issue that I had with Don’t Ever Change would be the instances where the narrative would drop. There would be a lull in action and my attention would often start wandering. This was often made up for through the more comedic scenes that would occur between Eva and her experiences as a camp counselor. Still, these were moments that did impact my time as a reader. I would recommend Don’t Ever Change to readers who are looking for a novel that has a relatable character who can portray the ‘average’ girl. Any readers who are looking for a fun teen-fiction novel should also give Don’t Ever Change a go, as well as any readers who want a fun summer read.